Six packs, new artwork planned for Holy City Pluff Mud (in a few months) | Drink. Blog. Repeat. EDIT: False alarm, folks! Seems as if this was just some artwork thought up by the designer of Holy City’s mural and taped on bottles and packaging. That’s why you don’t blog before you have a cup of coffee. (And now that I look at it, there’s clearly a piece of tape on the bottom right corner of that six pack.) Six packs and new artwork are in the works, but they’re a few months off. Still, fantastic artwork and something I’m sure a lot of people would love to see on shelves one day. 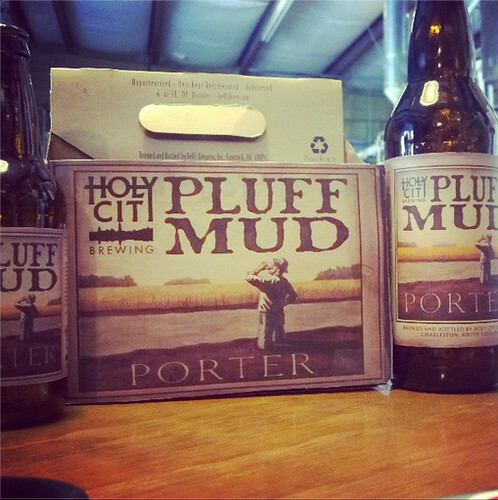 For the longest time, Holy City‘s GABF gold medal-winning Pluff Mud Porter has been available in only 22 oz. bomber bottles or on draft. But if the above photo – which was posted on the Instagram feed of the Charleston Beer Week – is any indication, that’ll be changing. From the looks of things, Pluff Mud will be coming to six-pack bottles as well as getting some new label artwork on both the smaller bottles (seen on the left) and bombers (on the right). The current label features the Holy City logo on a white background and the GABF gold medal prominently displayed, as it should be. No word on if this is the final artwork, when it’ll be hitting shelves, etc. But on a personal level, I say the more Pluff Mud, the better. Pingback: Holy City readies new bottling line | Drink. Blog. Repeat. Pingback: Pluff Mud Porter coming to six packs | Drink. Blog. Repeat.